People with SSD have long term suffering because of many illnesses. But, there are no diagnosed health problems that explain their symptoms. SSD causes worry and has a bad impact on daily life. The cause of SSD is not known since there are no specific health problems. SSD may be linked to how the brain works. It's thought to be caused by mental or emotional problems. SSD tends to start in the early adult years. People with SSD suffer with these problems for years. It leads to testing and treatment that's not needed. People with SSD complain about problems all over the body. It causes the person to worry too much about their health, which is the main problem of SSD. 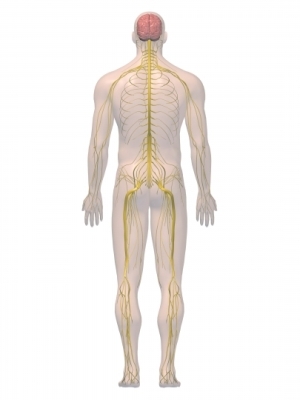 An emotional event may trigger physical symptoms, sometimes through peripheral nerves (yellow). Are very dramatic about what they're feeling. But, the symptoms are not talked about in a clear way. Visit more than one doctor for to get a diagnosis or get treated for the same problems. Have test results that don't explain their symptoms or confirm an illness exists. It is important to note that people with SSD are not making these problems up or pretending to be sick. Your doctor will ask about your symptoms and health history. Your answers and a physical exam may point to SSD. The goal is to make help you learn to control what you feel. It will also help you with your work and social life. Your doctor will help you find the best way to do this. Find a doctor who cares about your issues and will help you. Psychotherapy—To help you find ways to deal with stressful or painful issues. Cognitive behavioral therapy —To help you learn to handle stress. You will change how you think. This will help you gain control of your feelings. Medicines—To treat other mental health problems. There is no way to prevent SSD since the cause is unknown. Diagnostic and Statistical Manual of Mental Disorders (DSM-5). American Psychiatric Association; 2013. LaFrance WC Jr. Somatoform disorders. Semin Neurol. 2009;29(3):234-246. Kurlansik SL. Maffei MS. Somatic symptom disorder. Am Fam Physician. 2016;93(1):49-54. Somatic symptom disorder. EBSCO DynaMed Plus website. Available at: https://www.dynamed.com/topics/dmp~AN~T116198/Somatic-symptom-disorder . Updated August 23, 2018. Accessed August 31, 2018. Somatic symptom disorder. Merck Manual Professional Version website. Available at: https://www.merckmanuals.com/professional/psychiatric-disorders/somatic-symptom-and-related-disorders/somatic-symptom-disorder. Updated January 2018. Accessed August 31, 2018.